The No. 6 Warriors opened up 2019 with a pair of impressive road wins to improve to 9-0 on the season. It was academic for the Warriors on Saturday in Peterborough, sweeping aside the Trent Excalibur in straight sets. Set scores were 25-16, 25-18, 25-13. Samantha Warner led the way with 8.5 points on four kills, one service ace and a game high of five blocks. Sarah Glynn was also a contributing factor with 7.5 points on seven kills and one block while Ella Stewart had five points. Claire Gagne collected 26 assists in the win while Sarah Remedios was stellar defensively with eight digs. On Sunday, Waterloo had their first big test of 2019, up against the No. 8 Toronto Varsity Blues. The Warriors bent but did not break and came away with a statement 3-2 win over the Blues. It was Waterloo’s first win over Toronto since 2010. 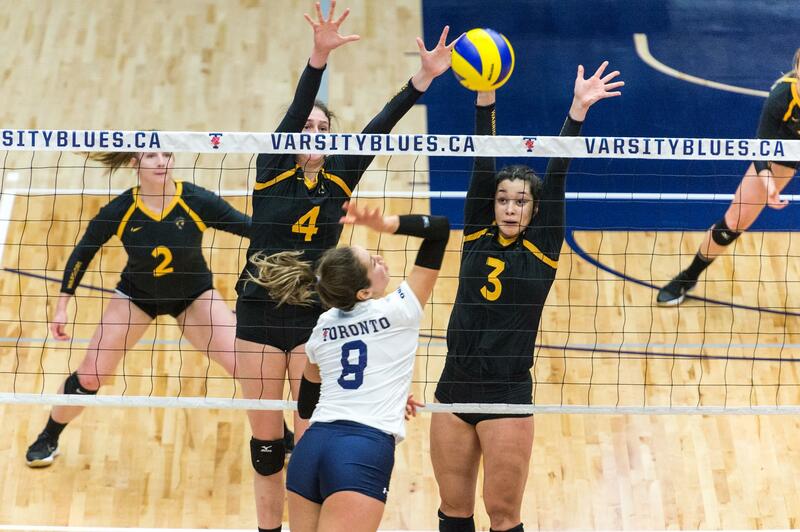 Toronto took the opening set 25-22 before Waterloo bounced back with a big second set win, 26-24. Toronto again took the lead winning the third, 25-17 before Waterloo continued the trend in the fourth, claiming the set by a score of 25-15. Waterloo maintained their momentum into the fifth set, winning it 15-10 to pick up a huge win, their ninth of the season. Sarah Glynn had a monstrous game with 25.5 points on 15 kills, an incredible six aces and five blocks. Claire Mackenzie was also unstoppable with 18.5 points thanks to 16 kills, one ace and two blocks. Samantha Warner also had another strong game with seven kills while Brooklyn Gallant put down six. Claire Gagne was stellar in the setup with 41 assists and also had 16 digs. Sarah Remedios was collecting a game high of 26 digs while Gallant had 22. Waterloo is now first overall in the OUA at 9-0 and 18 points well ahead of Western and McMaster in the West who sit six points back at six wins each. Waterloo will now return to the PAC for the first time since November for five straight home games. The black and gold kick off the home stand on Friday at 6 p.m. against Ryerson looking to improve to 10-0.